Bournemouth Coastal BID, in petrified partnership with a host of Southbourne based businesses, enables the return of Southbourne’s Spooktacular ‘Frankenfest’ on Saturday 27th October. 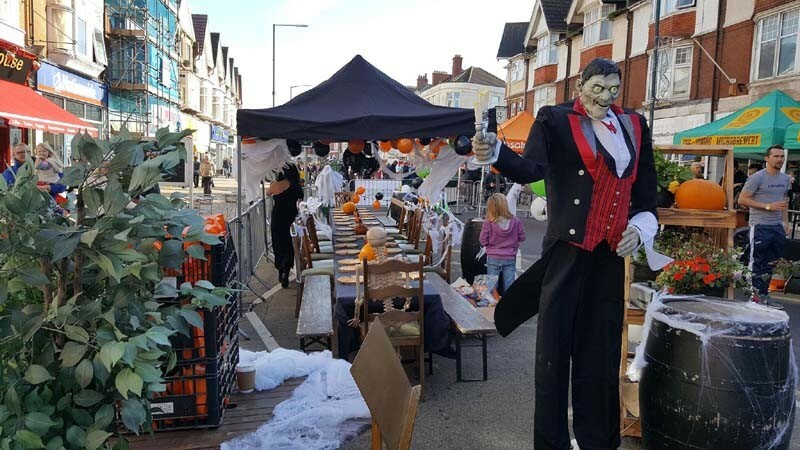 Following the success of last years event, which attracted thousands of visitors for a day of freaky family fun, Frankenfest will return to Southbourne Grove for the second year this October. Taking place at Southbourne Grove on the 27th October from 10 am – 10 pm, visitors will be treated to a day of ‘spooktacular’ entertainment featuring the now famous annual Halloween Parade, the original Doctor and the Medics, plus world-famous Madness tribute band, the Los Palmas 6. Frankenfest 2018 has been made possible thanks to support from Bournemouth Coastal BID in partnership with the Larderhouse, Terroir Tapas, Bowden Financial, Bournemouth University, Conker Gin, and The Way Outback Bar. Set to be one of the many highlights of this year’s Frankenfest, the Halloween Parade, starting at Southbourne Green at 5 pm, will welcome visitors to join in the dress up procession and trick or treat local businesses lined up on the streets with treats. Last year around 500 visitors took part in spooky costumes including wicked witches, blood-sucking vampires, and frighteningly cute pumpkins. This year, there will also be a full line up of music throughout the day culminating in a special performance from iconic 80’s glam rock band, Doctor and the Medics. Those in the audience will be treated to their full Halloween show featuring dancers and spooky effects. Organisers have also announced that Los Palmas 6, one of the UK’s top Madness tribute acts, will be treating all in attendance with classic tunes bound to set the party mood. During the day, free activities will include exploring the mad Professor’s Laboratory, a whole marquee dedicated to the creepy classic ‘Feeler Box’, and a live photo booth with a zombie family. Plus, apple bobbing, face painting, and kids’ rides will be on hand to keep the little ones entertained. If you would like to help towards the running costs of this not for profit event through their Just Giving page please search for www.justgiving.com/crowdfunding/frankenfest2018. For more information about Bournemouth, Coastal BID visit www.coastalbid.co.uk.